Here are some of your questions from the protein conditioner series Carole asks, 'Regarding protein conditioners, can you please let us know which proteins are from animals?' The main types of hydrolysed proteins are collagen, keratin and wheat. Of these, only wheat is strictly plant based. 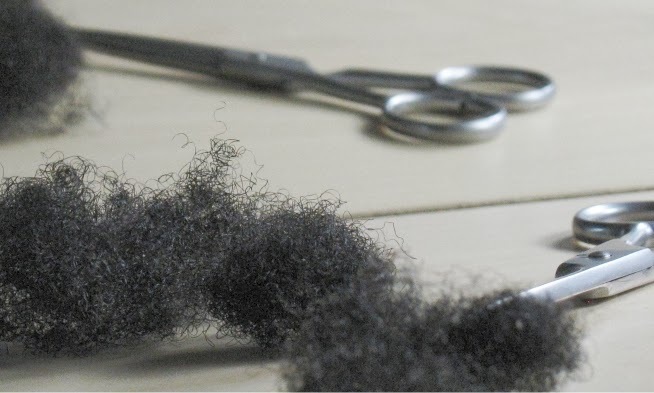 Keratin does tend to be sourced from animals (for example wool from sheep) and collagen has a variety of sources with cattle being a main source Didi asks, 'I use megatek rebuilder. It contains hydrolysed keratin and I think it is quite a heavyy protein but it says leave on for 5 mins then rinse - does this mean it gets washed out?' From the ingredient list for this product, keratin is very high up in the list which means it probably is a very protein rich conditioner. If the keratin has been hydrolysed to a good size then some of it will remain on your hair because it will form temporary bonds to it. A lot of the product would be washed out. This is not a bad thing because too much protein leads hair to feel and be very brittle so using protein rich conditioners is always a balancing act. Didi and Jan ask, 'I do not use heat with my protein conditioner does this make it less effective than say aphogee 2 step which requires heat and gets rock hard?' Not necessarily. Manufacturers design and test their products to perform best at specific conditions. Adding heat to a product which has not been formulated to be heated, may not be useful and even could be harmful. For example the ingredients may be heat sensitive or the preservatives used could be changed by applying heat. It could also be harmless, but the results would be unpredictable. In short, my view is that the manufacturer will produce a set of instructions for their product. They will have performed several tests in these conditions and end up with a formula (ingredients and conditions) which they believe to be most suitable. Deviating away from this means you are experimenting. If you like predictable results, stick with the instructions on the label. If you are willing to experiment, just be aware that the results could turn be good, bad or indifferent. KN asks, 'You did not mention following up a protein conditioner with a moisturising conditioner, is this necessary?' Good question. If the conditioner has hydrolysed protein as one of the first 5 ingredients, then yes it would probably be beneficial to follow up with a moisturising conditioner (see the natural hair shopping list). This is because as I mentioned before, high protein content can lead to a dry brittle feel to the hair strand. Applying some softening ingredients improves the pliability of the hair. However if the conditioner has a few amino acids or hydrolysed wheat thrown in towards the end of the ingredient list, then in all likelihood, it will behave more like a moisturising conditioner rather than a protein conditioner. Thanks for the answers Jc. I like megatek so far and will stick with it. Good to know it may actually be doing some good. I truly beleive my hair strands are much thicker and stronger with less breakage since I added it to my regimen. I own a bottle of aphogee 2 step but only used it once -too much hassle plus, it dripped everywhere and stank up my house. LOL! Jc, i agree that you may not need to follow up a protein conditioner with a moisturizing conditioner if the protein is far enough down the list. i think if you treat the conditioner like a protein conditioner and leave it on the hair for several minutes that you should at least do a quick rinse with a moisturizing non-protein conditioner. i find that my hair feels a little bit stiff when styling if i don't. for example, using trader joe's nourish spa which contains soy protein near the bottom of the list: if i leave it on my hair for more than 1 minute, then my hair feels funny. not supple like if i just applied and immediately rinsed. when starting to use protein, especially if you haven't used it in awhile, just pay close attention to how your hair feels. then you will know how frequently you can apply it and if/when you need to follow up with moisture. Question is yogurt considered protein? Just some additional thoughts on yoghurt. I have used this as a prepoo treatment mixed with coconut oil - it really softened my hair. I know it was not the coconut oil because I used it before as a pre-shampoo treatment and it did not have the same effects. I wonder why yoghurt softens hair? I'm glad you brought up the following the manufacturer's instructions issue. I know lots of people will say something like, "I know my hair better than they do, so I'll do what suits me." I'll just say this, I make my own products, so I know a little bit about product formulation. Some preservatives being used in the market, in fact a lot of them, are formaldehyde releasing when heated.